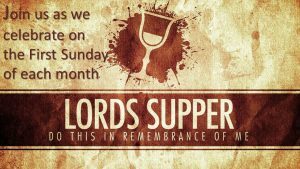 AS ACUSTOMED WE CELEBRATE IT ON THE FIRST SUNDAY OF THE MONTH TOGETHER. THIS IS A MORNIG THAT WE REFLECT ON HIS SACRIFICE AND WHAT HE DID FOR US AT THE CROSS. PLEASE COME WITH YOUR HEART PREPARED.